It's back! Enough of you enjoyed my first foray into themed mixology enough for me to consider making this a regular series. And, as I'm able to invent or refurbish drinks, I will. So if you enjoy your theme park history sprinkled with some distilled spirits, let's have a drink on it! This month's drink comes to us from the Polynesian Village, through a column written by Dorothy Chapman for the Orlando Sentinel - Thought You'd Never Ask, a long-running series divulging recipes for area restaurant dishes, including many at Walt Disney World. Published in December 1977, and republished the limited edition spiral bound book collection of the articles in 1980, The Seven Seas Drink immediately lept out at me - for reasons both good and bad. This immediately got my attention for a few reasons. First, it was never republished elsewhere and has sunken into absolute obscurity. Second, it specifically calls for something a lot of old-time Disney World collectors have - the large, footed, frosted Polynesian Village tiki mugs. And the third reason it lept out at me is because it's a total disaster as a recipe. Look at that - two kinds of orange liqueur plus orange juice? Squeezing an orange into the glass? Who would do such a thing?? And even worse, if you actually went through the effort to make the darn thing, it was a total downer - a sickly, sweet confection reminiscent of Orange Fanta and with enough sugar to give you a headache. Can it be saved? Is it even worth saving? So what's going on with this drink? If you've looked at other Walt Disney World recipe guides from before the mid-90s, you may have noticed that Disney was not exactly a temple of great cocktail drinking, a distinction they still hold today. But in the 70s, things were even rougher, because the "specialty" drinks were not even fully mixed by the local bartender. Instead, Disney made use of a huge number of mixes. And I don't mean huge bottles of Lime Juice Cordial - Disney made their own mixes, daily, in the same gigantic centralized kitchen which produced much of the food served at Magic Kingdom and the hotels. Working from early in the morning, white aproned kitchen staff would be hard at work mixing huge plastic buckets of mixes for Scorpions, Mai Tais, Banana Bogeys and Monorail Pinks. 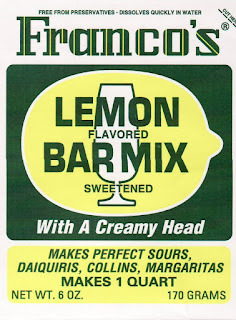 Distributed to the individual bars, barkeeps would merely have to dump out the correct amount of drink mix, add the base spirit, maybe some soda water, shake it all up, and call it a day. 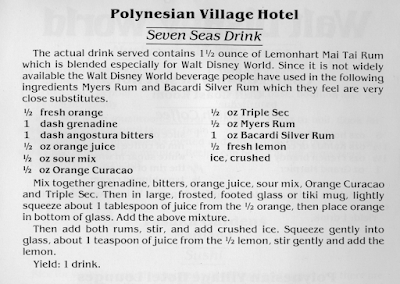 With this in mind, it's easy to make more sense of the Seven Seas Drink - the recipe asks the barkeep to squeeze fresh orange and lemon juice into the glass to add some freshness back into the likely hours-old mix. 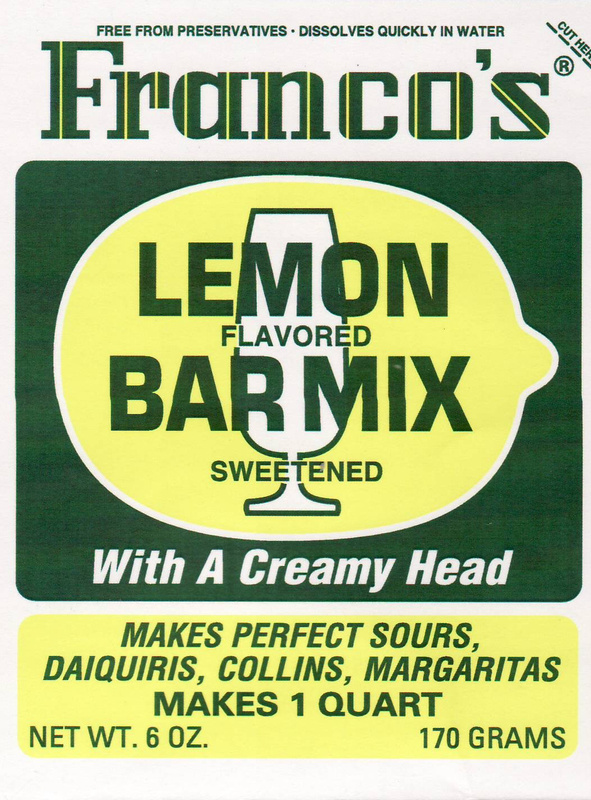 If you looked at the "sour mix" and thought of Rose's Sweet and Sour, you're wrong - we're probably talking about the even grosser powdered lemon bar mixes, probably sourced from Franco's in nearby Pompano Beach. The Orange Juice was likely direct from the carton. Anybody sitting down to make the drink today can simply substitute the appropriate amounts of fresh orange juice and fresh lemon juice and dispose of the need to squeeze citrus into the glass, then build the drink and stir. An approximation of the sour mix can be obtained by using half lemon juice and half sugar syrup. This also explains the baffling choice to call for both Curaçao and Triple Sec, both orange flavored cordials - one sweet, one dry, both working together to keep the already astronomical sweetness in check. Today, we have access to the excellent Pierre Ferrand Dry Curaçao, making such mixological tricks unnessecary. Finally, there's the question of the rum. If any modern day Tikiholics are reading this, they likely gasped at the call for Lemon Hart Rum, since the Lemon Hart 151 is currently a beloved if scarce ingredient in tropical drinks. Based on reviews of Lemon Hart's modern portfolio and from Disney's instructions to cut Bacari Silver with dark rum, I'd say that Lemon Hart 1804 is the nearest modern match. I've been unable to find Lemon Hart 1804, and the reviews online lead me to believe it's fairly mediocre, so in this case feel free to use any blended aged "Gold" rum you personally enjoy. Mount Gay Eclipse is a decent and widely available choice, and El Dorado 5 or 8 is even better. I do NOT suggest blending Bacardi Silver and dark rum as Disney suggests. Shake very hard with crushed ice and dump, unstrained, into a Polynesian Village frosted mug. Garnish with the spent Orange shell. Drink with optimism. If you make this and the original recipie specified in Thought You'd Never Ask, you'll notice only very minor improvements. Simply put, this is still far, far too cloying and sweet for its own good. So let's see if we can start balancing this thing out, and we'll break all three of the major components down into categories. In a hotel bar in Florida in the 1970s, perhaps 1.5 ounces of the good stuff was enough, but today we can do better. I boosted the rum content to an easy to remember 2 ounces, which allows us to combine an ounce each of multiple rums for deeper flavor. The suggested combination of light Bacardi and dark Meyer's is not that great to begin with, and in my opinion Bacardi is expensive and fairly insubstantial. Even switching the recipe over to using a gold rum, as I did in the halfway version above, yields a considerable improvement. Frankly, though, I think in this drink the darker you go with your rum blend, the better. Unless you're absolutely dedicated to using a white rum in this, you can do better by combining a gold aged rum and a dark one. I ended up using an equal mix of Mount Gay Eclipse and El Dorado Dark for testing purposes. A half ounce of sour was far too little for this job. Looking to classic exotic cocktails for guidance, you'll see very few that use orange juice by itself, usually mixing it in combination with a stronger juice like passion fruit or pineapple. This is because, even when fresh juiced, orange is simply too wimpy to put up much of a fight against rum. I tried boosting the amount to 3/4 of an ounce of each orange and lemon juice, and got a much clearer citrus flavor. Even with the excellent Pierre Ferrand and with boosted juice and rum, this drink needed far less orange liqueur. Few tropical cocktails use a full ounce of the stuff, and it's because it's really very bossy and can quickly take over a drink. Cutting back the Curaçao to half an ounce helped, but really, this drink needed some depth. So enter the secret of many an exotic cocktail: the spice cabinet! Given that this is a blog about weird old Walt Disney World, not drink mixing, I wasn't about to tell you to make your own cinnamon syrup or something like that. As I saw it, there were only two viable bottled options: Allspice Dram or Falernum. Allspice Dram we saw in my last cocktail, The Howling Dog Bend, and I love its spicy complexity, but in this citrus-heavy drink it simply did not fit in. Falernum is a spiced ginger syrup from Barbados, and it nicely rounded out the Seven Seas Drink with just a hint of complexity. I like John Taylor's, but Trader Sam gets very nice effects with the spicier BG Reynolds. You can also make your own fairly quickly, especially if you begin with a commercial almond milk, which I recommend. So to your half ounce of Curaçao add another half ounce of Falernum. Now we were getting much closer to a proper drink. 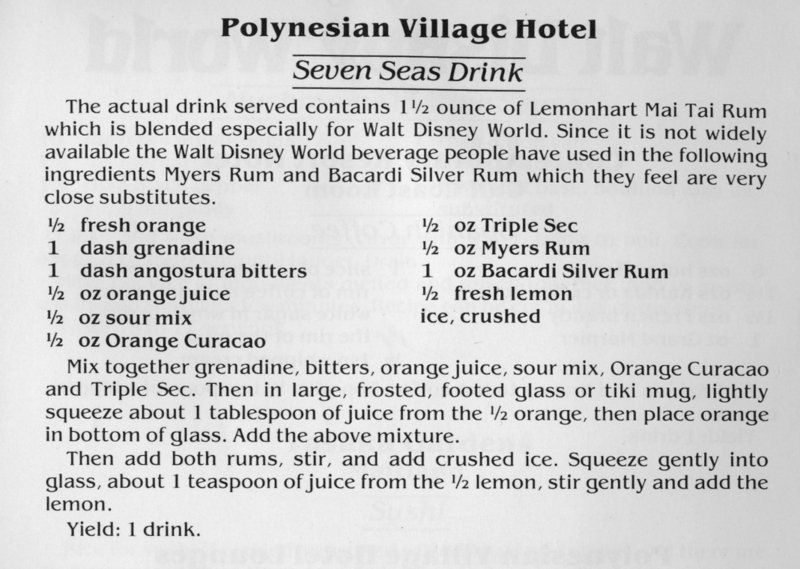 At this point I had to stop and consider carefully whether the drink was likely to continue improving, and moreover, what exactly the Seven Seas Drink was. After all, this was not some extravagant Donn Beach 11-ingridient opus - this was a resort drink, that tasted like oranges, intended to be enjoyed on the shores of the Seven Seas Lagoon. My inclinations to start floating 151 rum on top of it or adding hazelnut bitters were likely to only bring me further and further away from my goal, which was to improve the 1977 original. But I still had a few more tweaks to try. I tried cutting half of the rum with Dry Gin, a common Trader Vic technique to lighten up a heavy drink, but the benefits here were negligible - we may as well have been using vodka. Instead, I found that the darker I took the rum blend, the more interesting the drink became, and ended up enjoying a blend of 1 oz El Dorado Dark to 1 oz Black Overproof Dark (think Lemon Hart 151, Gosling 151) the most. However, use whatever work for your interest and budget level. I tried adding pineapple juice to the drink, but in both half ounce and ounce intervals it only seemed to muddle up the balanced citrus flavor. Speaking of the citrus, I found that bottled OJ works just as well as fresh - the fresh orange juice really only adds a nice orange shell that you can dunk in the drink. If you want to do this, you should use a medium-sized Florida-style juicing orange like a honeybell instead of the monster navel oranges that come from California. Finally, I decided that the bitters weren't adding much to the mix. You can still use them if you like, but even after adding 3 very aggressive shakes to the mixing tin, I found the flavor was simply lost in all of that juice and rum. Besides, I liked that I had 3 measures of six ingredients, making my improved Seven Seas Drink one of the few tropical cocktails that was easy to remember, and the Bitters were throwing off that neat symmetry. I like to use my Waring Drink Mixer to put this together, otherwise known as a milkshake mixer. If your go-to drink is a Mai Tai or Test Pilot you probably have already gotten one of these beasts, but for the rest of you, the milkshake mixer is entirely optional. I think it adds just the right texture to tropical drinks when blended up with crushed ice, and it somehow aerates and brings out the flavor in your cocktail syrups like falernum. If you're using a traditional shaker, you're going to want to shake the daylights out of this drink until it's very, very cold, then open up the whole thing and dump the contents - ice and all - into your beautifully frosted tiki mug. Do NOT attempt this with a classic blender with a blade in it, because you'll just end up turning all of your ice to slush and cleaning the darn thing out later. If using fresh orange juice, place spent orange shell in bottom of 1970s Polynesian Village frosted tiki mug. Combine all ingredients and crushed ice and shake until very, very cold. Pour shaker contents, unstrained, into frosted mug. Add ice cubes as needed until mug is full. Garnish with spent lemon shell and drink through a long straw. For garnish, I like a few pineapple fronds if I have them, but a nice big bunch of mint works just as well. Go ahead and stick an umbrella in that lemon shell - it's a resort drink, after all. Did you like this for some reason? Check out our previous drink here, The Howling Dog Bend. 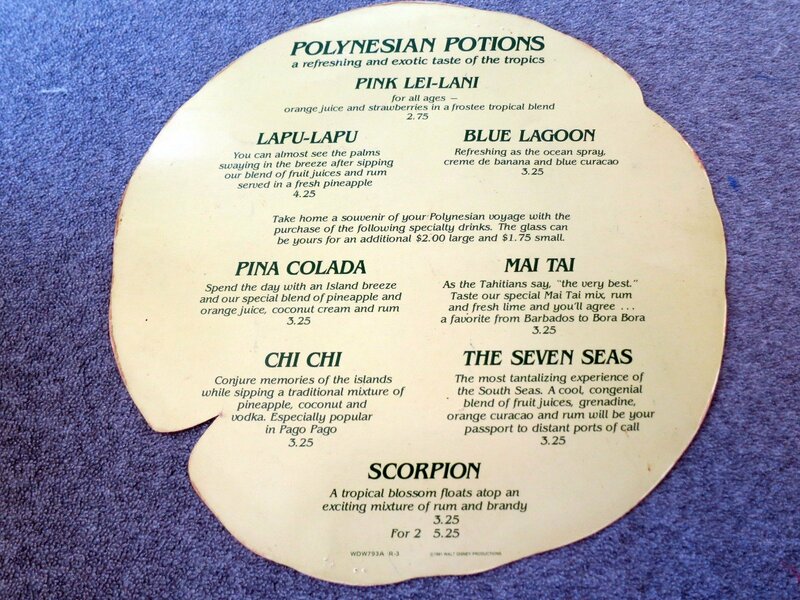 Or drop by the Walt Disney World History Hub for more 1970s Polynesian Resort! A few years ago, I previewed a bit of the work being done in an infuriating little corner of Disney music that I call "The Swiss Loops". This is a group of three or four Jack Wagner loops created at an unknown time consisting entirely of alpine music - yodeling, accordions, lederhosen, etc. So grab your alpenhorn and feathered cap, and let's finally get this out of the way - we're going to plunge into those infernal Swiss loops. I hope you like polkas! One of the least appreciated areas of Magic Kingdom is the stretch of Fantasyland that runs from Liberty Square, up past what was once the Skyway Station, past Small World, and ends with Pinnochio Village Haus. On early blueprints, this is called the "Pinocchio Street" - an area of steins and Bavarian charm anchored by a Swiss chalet spitting out a steady stream of brightly colored sky buckets. Compared to the more prosaic and less elaborated themed west side of Fantasyland, and especially compared to the Fantasyland of 1955 which was still what Disneyland had, this little area was the seed that eventually would overrun the entire concept of Fantasyland, turning the whole of the area into Little Europe. It may not look like much to anybody who's been to the 1983 Fantasyland at Disneyland or the 1992 version in Paris, but for 1971 the Pinocchio Street was a major accomplishment, and had its own specific project name to prove it. Regardless, what is likely the earliest surviving piece of music associated with this area was thankfully recorded by Mike Lee in 1991. 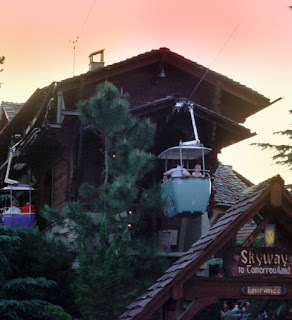 It's only 30 minutes long, which puts it in line with other early music loops of its era, and the two Capitol Records LPs used in the Matterhorn Bobsleds queue BGM also appear in it. Thanks to a snippet posted by the excellent website WaltsMusic, I'm confident in assigning a date to this one. The WaltsMusic segment, taken from Jack Wagner's collection, is the first seven tracks represented here, and is labeled "Village Haus Disneyland 1974". Since Disneyland didn't have a Village Haus in 1974, this has to be our date. 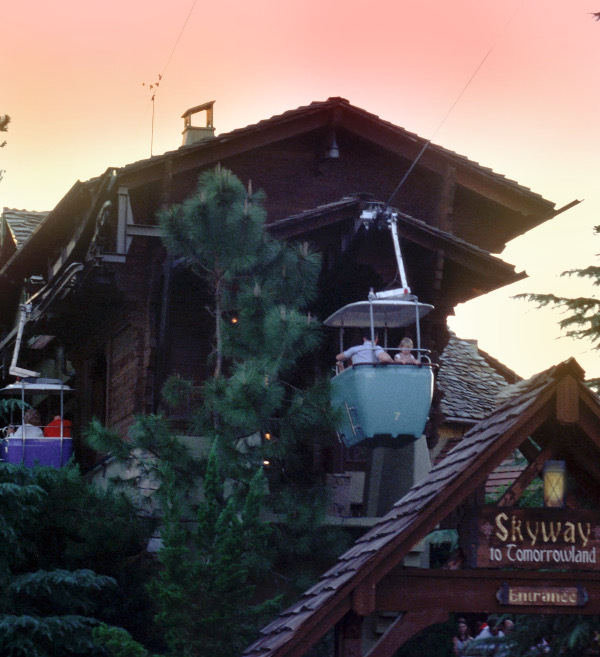 I'd give a lot to know if music played in the Skyway and Village Haus before 1974, but like a lot of early Disneyland and Magic Kingdom music, we'll just never know. For this track to be playing in 1991 seems astonishingly late considering that its replacement, fully considered below, had already been available for eight years by that point. However, the 1990/1 date does line up with when Magic Kingdom was really starting to standardize their sound system - see my piece on Tomorrowland for another example. 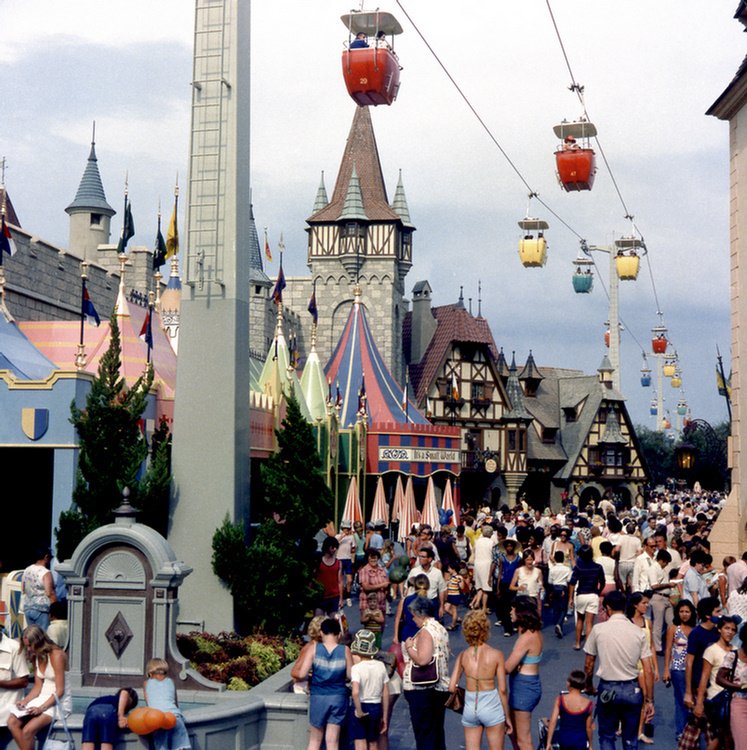 Once "Fantasyland West" received its new digital music playback system, of course it would receive the newer, longer version of the Swiss loop. For decades, a 60-minute loop has been floating through the Disney music diaspora called "Fantasyland West". Trying to identify the tracks in this loop has always been an absurd nightmare of yodeling, brass bands, and alphorns - after even just a few minutes, all of the yodeling begins to bleed together and my eyes would begin to roll back into my head. Which is how things stood for years. This 60 minute loop played in the Skyway station at Magic Kingdom and Disneyland, inside Village Haus restaurants in California, Florida, and Paris, and heck, even at Tokyo Disneyland - here's a quick video where you can hear it. Besides the fact that it had seemingly been playing since anybody could remember, nobody had any idea where it came from or what it was made up of. Most of the really early Magic Kingdom music loops were really odd lengths. But even if Disney had wanted to replace the Skyway / Village Haus loop as early as, say, 1975 - when both Main Street loops got filled out to a full hour - it's hard to imagine them having a good incentive to pay Jack Wagner to do the same work over again. In the early 80s, Disney was moving to standardize the length of all of their BGM loops to exactly 60 minutes thanks to emerging digital formats, a standard that holds even today. What makes more sense to me is that Jack prepared the 60-minute loop as part of his commission to prepare the music for Tokyo Disneyland. Many of his loops for TDL are interesting expansions and variations of his earlier loops at Disneyland and Magic Kingdom, and all of them are a rock solid hour in length. It also makes sense that Disneyland would use the same loop as part of their New Fantasyland project, which saw the addition of a German-style Village Haus of their own. In mid-2013, our understanding of the Fantasyland West loop improved considerably when, with no warning whatever, most of the source tracks appeared on iTunes. Suddenly, we had track names and performing artists but with no real insight into where these things came from. The album in question was called "Bi Eus im Schwyzerland, Volume 3", released by the mysterious "Elite Special" and dated 1974. Trouble was, who knows if the metadata provided on the album was at all accurate. Even more worrying, the total run time of the digital release was nearly an hour - a total impossibility on the vinyl records Jack Wagner was working off of in the 70s. So just who the heck was Elite Special? As it turns out, Elite Special was a sub-label of Turicaphon AG - founded in 1930, and which still exists today in the Swiss town of Riedikon (on the Turicaphonstrasse!). Once you have label and performer information, the rest begins to fall into place. 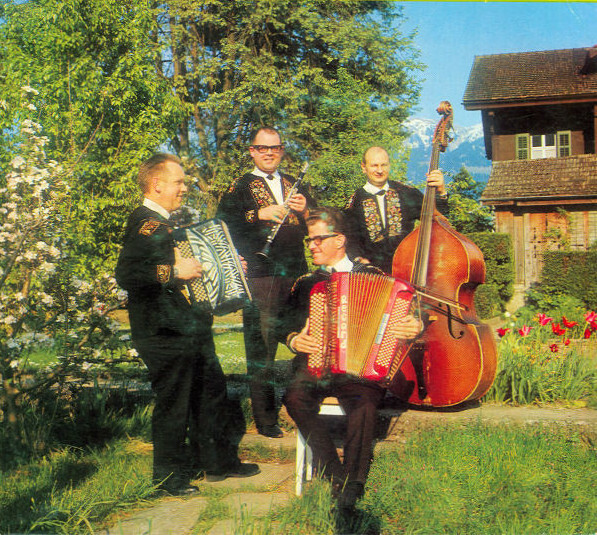 Its seems as though Truicaphon took a special interest in recording and releasing Swiss folk music in the 1950s - although for all we know, they were releasing these recordings on 78 records in the 30s. Alpine music being of limited interest outside of Switzerland, eventually the Elite Special sublabel was formed to recycle their music into budget LPs of the kind that haunted drug stores through the 60s - cheapjack releases with names like "I Remember Switzerland". Just looking at the mysterious track data and recording company history, that much of the story seemed obvious. But I still was not satisfied with this "Bi Eus im Schwyzerland, Volume 3". I knew the chances that a single record had nearly the entirety of a Jack Wagner loop was too persuasive to ignore, but after weeks of checking databases and virtual auction sites in English and German, I could find no evidence of a physical release of Bi Eus im Schwyzerland - never mind Volume 3, I couldn't find Volume 1 or 2. I knew it couldn't be this obscure. After literally years of downtime, in which Pixelated put the rest of the puzzle together, finding "Accordion in Gold" by Horst Wende, I was ready to try again - and I finally struck gold in the Worldcat, where "Holiday in Switzerland" had a single entry with nearly every track listed - the only thing missing was the track "Jodel-Polka". I even found a company in the United States selling a CD of the album. I was so close I refused to believe that this was not the correct album. After another search through German eBay, I was able to find the actual LP - and "Jodel-Polka" was included. As it turns out, Jack had dumped practically the entirety of "Holiday of Switzerland" into his Village Haus loop, and in near exact album order, no less. With the 4-year mystery of "Bi Eus im Schwyzerland" solved, the Village Haus loop finally came into focus. One of the nice things about having the actual Holiday in Switzerland album to look at is that it clarifies that not all of the tracks included in the loop are traditional songs. Nearly everything on Holiday in Switzerland is an original composition - these traditional folk music groups, which had likely been performing together since before World War II, and who recorded their efforts for a small, local recording industry would eventually go on to be heard by billions of vacationers in search of a cheap pizza in Florida. That's an exceptionally bizarre path to infamy, but it's a good one. Also interesting is the inclusion of a single track by the Fantasyland Polka Band smack in the middle of the loop. Many versions of the loop begin with the Heigh Ho, but the loop does appear to play out as I've got it arranged here, with the Polka Band around the 30 minute mark. The Polka Band was an afternoon offshoot of the Walt Disney World Band that hung around Fantasyland for a few years in the 70s, and their phantom appearance in their old haunt is intriguing. It reminds me of Jack's use of Fred Burri in the Matterhorn Bobsleds loop - a recorded testament of atmosphere music which was once recorded live. Honestly, this is probably how all of Disneyland's music loops began - a tape would be played while the band went off to lunch. A few years ago, a tape was sold on eBay which supposedly played in the Skull Rock seating area of the Chicken of the Sea restaurant in Fantasyland. Without having a transfer of the tape to be sure we'll never know, but it appeared to be a recording of the pirate band which played in that area in the early 60s. Intentionally or not, this notion survives in the Matterhorn and Village Haus loops of today. And with that romantic notion, I think we've found as good a place as any to finally put this subject to rest. Auf wiedersehen!